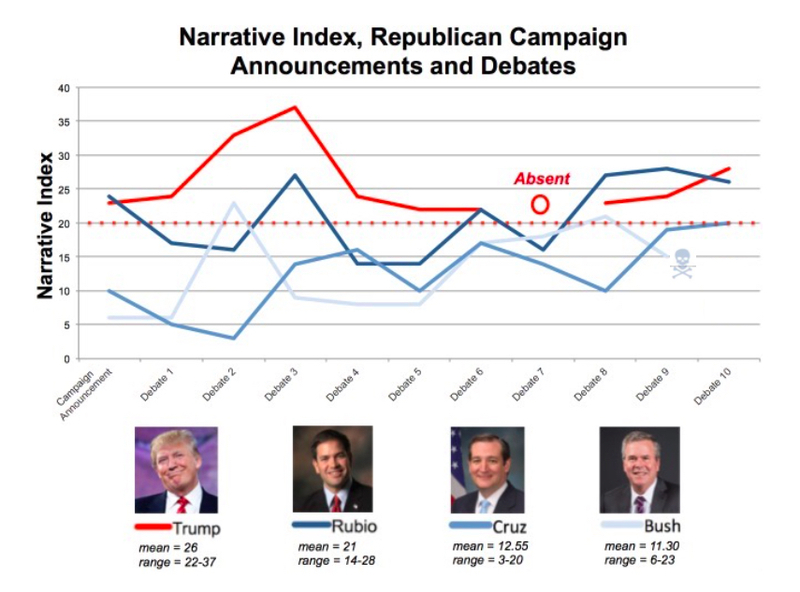 The Narrative Index pretty well tells the story — too little too late for Rubio and Cruz. TRUMP DOMINATED FROM THE START. In the previous three posts I explained The Narrative Index. I’ve been analyzing the Republican debate performances since the start. The data now tell the story pretty clearly. Bush and Cruz were wimps from the start, scoring below 10 repeatedly. Rubio has had some fight all along, and in the last three debates has been swinging hard (though notice how he dropped when Trump wasn’t there to push him in Debate 7). But Trump knows narrative. There’s no getting around it. He is a powerhouse. Love him or hate him (as most of my friends do), he knows narrative better than all the others. He will continue to be a force to be reckoned with.